Sir Roderick Impey Murchison was one of the most important figures in 19th century geology and exploration. He was Director-General of the Geological Survey, President of the Royal Geographical Society and publicly known as the ‘King of Siluria’. In July 1831, on his first field season as a solo geologist, Murchison explored the Wye Valley. Retrospectively, over his diary entry for one of the locations we shall visit, he wrote “This was the first true Silurian”. Our leader Duncan Hawley, who lives in the area, knows its geology intimately. The trip will explore Murchison’s field visits to the region in the early 1830s to gain a perspective on Murchison the man, his methods and geological thinking, how he modified the standard geological map of the time and how his visits to this area contributed to the publication of The Silurian System. The field trip will be centred in the town of Brecon, where Murchison and his wife stayed in the Brecon Castle Hotel. 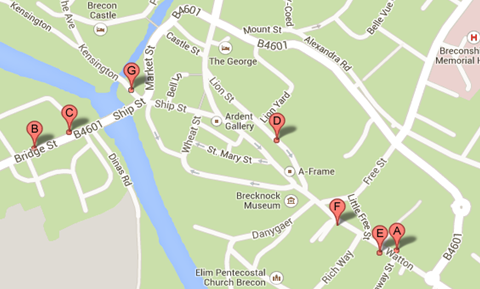 There are several hotels and B&Bs in Brecon itself for field trippers to book independently. (The Brecon Castle Hotel is almost fully booked on this weekend). Transport to Brecon will also be independent, and by car on the field trip. We will arrange sharing to reduce the number of cars in the field. We intend to meet for on the evening of Friday 18th for a briefing and then spend Saturday and Sunday following in Murchison’s footsteps. We plan to have evening meals together at the Brecon Castle Hotel on the Friday and Saturday nights. The price will cover these meals, full field notes and organising expenses. If a longer visit appeals while you are in Brecon, major attractions in the vicinity include the Fforest Fawr Geopark Visitor Centre at Pontneddfechan to the south-south-west and Hay on Wye ‘book-town’ to the east, with Kington and Stanner Rocks (which has associations with the history of geology) not much further across the border in Herefordshire. Register below for this meeting. Registration for the conference ‘A Centenary Celebration of the First Female Fellows of the Geological Society of London ‘ is now open. Please book your place here.